…today arrived this lovely book. A beautiful cover. Thanks Rhona! Thanks Anita, I was trying to blur the books in the background and have Rhona’s book standout, but the camera had other ideas. I didn’t have the time to be patient with it. I am truly surrounded by books here in my panic room and perhaps this summer when I do a clean sweep, which I do every summer, I will blog a picture of it. I’m very cozy with my books. 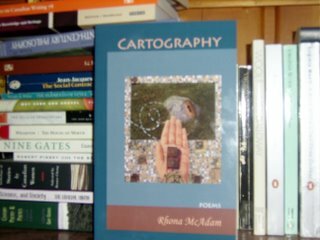 once i get my poor computer out of the shop (it needs an oil change and tire rotation… and god knows what else), i’ll be hitting PURCHASE on my big cart of books at amazon that includes rhona’s loverly new object. I love buying books, maybe too much. Rhona’s is loverly.